As temperatures plummet, wind chill skyrockets, and the number of layers multiply, chunky knits for these next freezing months seems like a no brainer. 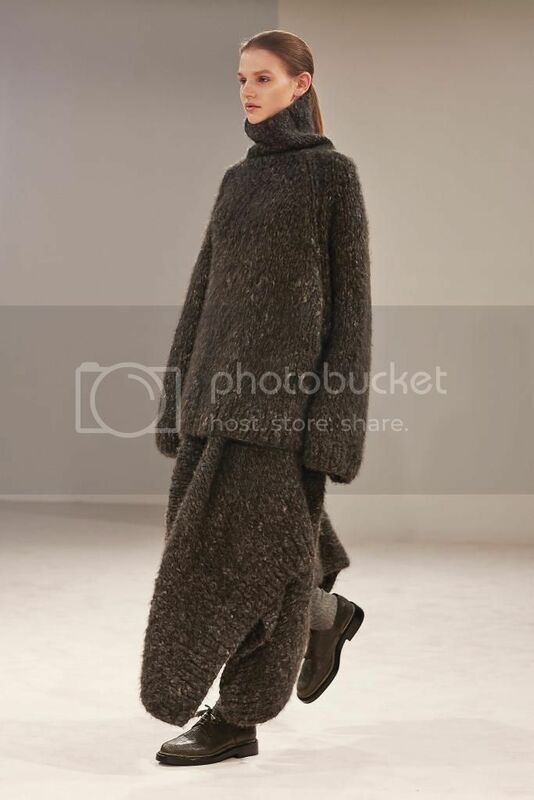 However, if the fall runway shows are any indication, this wintry style is just as stylish as it is practical. But, unlike a typical sweater and jean ensemble, these collections are anything but ordinary. 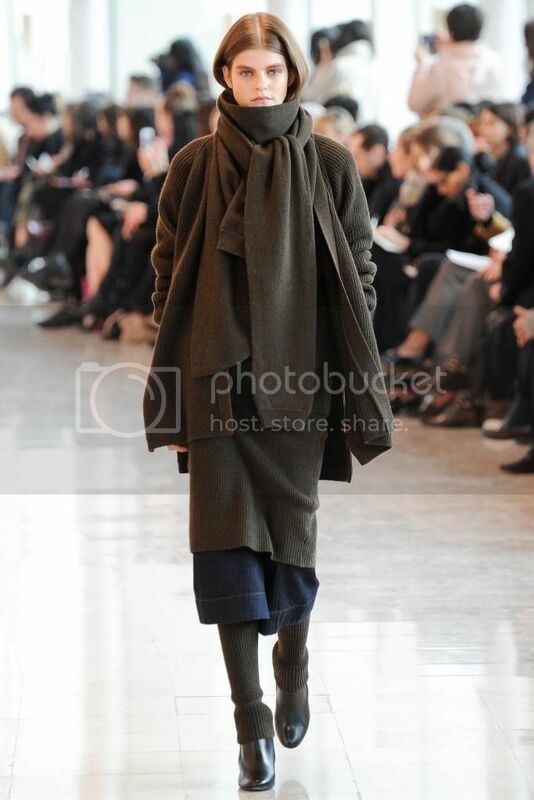 At Christophe Lemaire, layers of scarves, sweaters, and cardigans in earthy tones were effortlessly piled over semi-flared denim. However, it was the unexpected knit leg warmers that exude a "wear me now" air. On the contrary, The Row's Mary-Kate and Ashley Olsen created what appears to be the coziest, most textured look of the season. And most fashion fanatics will tip their hats off to any designer for creating a look that has both runway and lounge appeal. Though Michael Kors is known for being a king of American fashion, his take on this trend possesses an indescribable European nonchalance. 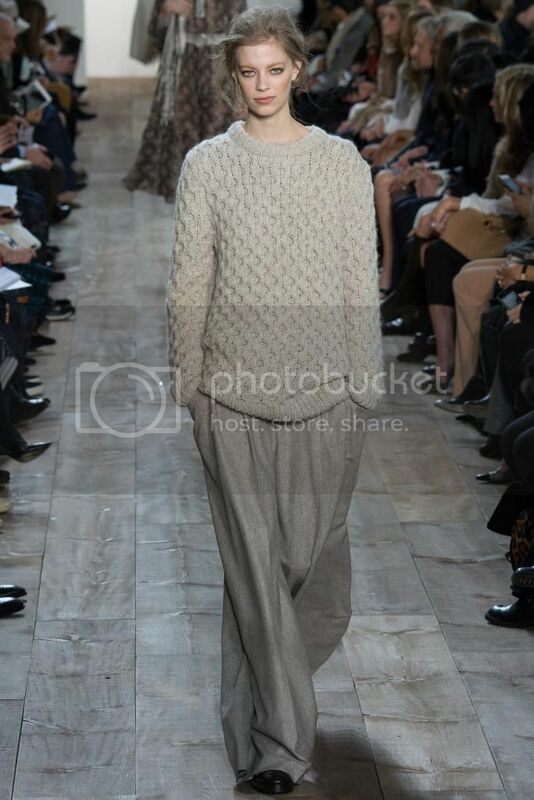 Cool girls everywhere should be pairing their knits with masculine trousers. But don't write this trend off as effortless and mildly disheveled. Adam Lippes paired sleeveless sweaters with an otherwise ladylike look. 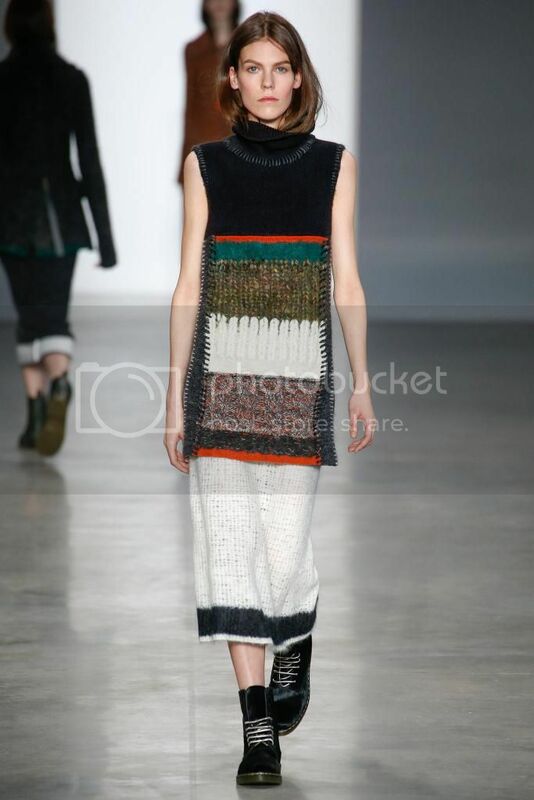 And leave it to the Francisco Costa to utilize textures and send several knit, yet utterly minimalist, dresses down the catwalk at Calvin Klein. Whichever sartorial path you choose, this season's knits revitalize an otherwise wintry staple. As easy as it may be to pair your sweater with a pair of skinny jeans and riding boots, amp up your winter wardrobe by styling your knits with more fashion-forward pieces. A basic sweater will instantly receive a chic upgrade when combined with a pleated skirt or wide-leg trouser. Though the pair of Uggs you secretly have lurking in the back of your closet seem like a great way to combat the imminent polar vortex, opt for a pair of a slim, up-to-there boot or sensible stacked heel. For an insanely stylish twist of this trend, focus on finding voluminous or extremely textured pieces in subdued hues, not vibrant brights. What are you going to wear your knits with this winter? Sound off below! Even in an industry that's fixated on the next new thing, fashion's finest frequently look to the past for inspiration. If the fall shows were any inclination, we have plunged head-first into a sixties revival. Though each brand has their unique way of defining the sixties, clean silhouettes and standout accessories were the underlying links for this marcotrend. 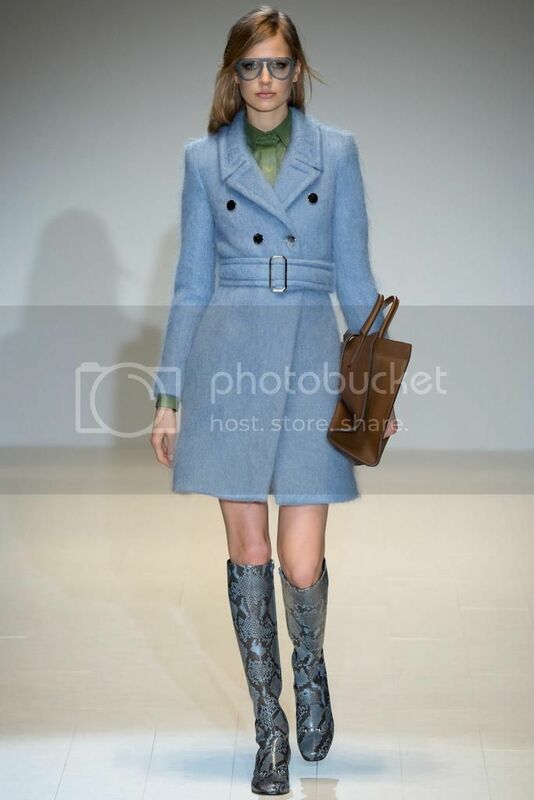 At Gucci, Frida Giannini paired tailored jackets in baby hues with tinted sunglasses and knee-high python boots. Giannini's daytime-approved looks were perfectly balanced with several embellished minis that any aspiring factory girl would wear. On the subject of sparkle, Miu Miu's collection of metal appliqué on streamlined silhouettes, which were occasionally layered underneath plastic coats, would make even the strictest minimalist envision herself at one of Austin Powers's parties. 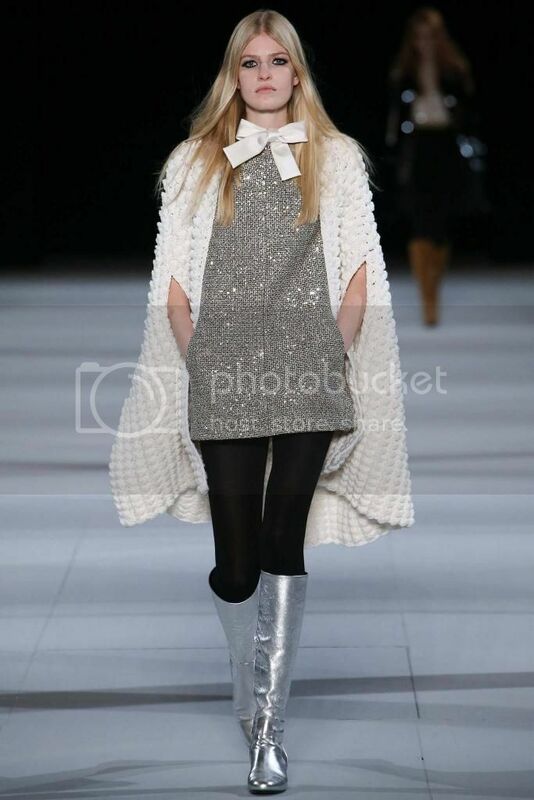 And who could forget Hedi Slimane's array of sequined semi-shift dresses and shimmery boots at Saint Laurent? A major fashion month moment. But rest assured, style savants: this sixties revival isn't synonymous with sparkle. Valentino's fall line offered capes in versatile neutrals, mod patchwork prints and collared dresses in poppy pigments. 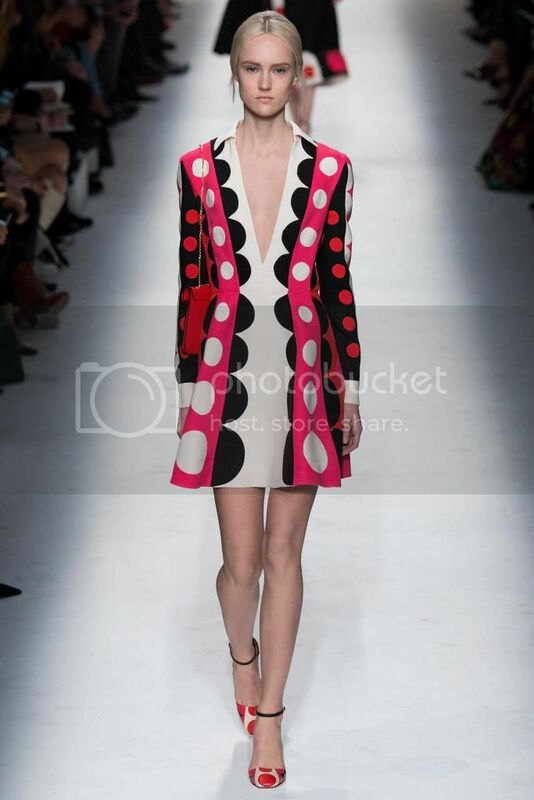 However, it was Maria Grazia Chiuri and Pierpaolo Piccioli's use of op-art polka dots that made this collection sing. 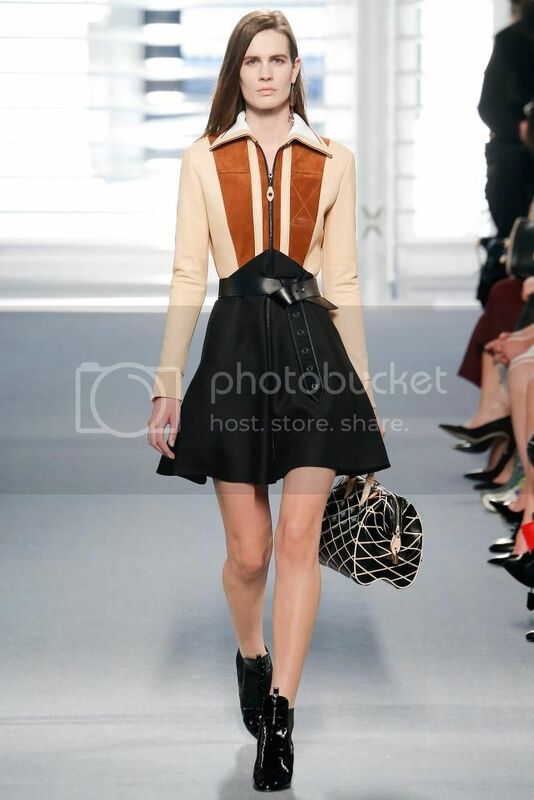 But perhaps that biggest sixties moment was none other than Nicolas Ghesquière's debut at Louis Vuitton. A far cry from Marc Jacobs's frills-filled parting collection, Ghesquière's take on this trend is more subdued than fall's alternatives. Sleek jackets, a-line skirts and feminine dresses are mixed with leathers, funky pattern combinations, and tough Chelsea boots. Whether you're craving to be Vuitton cool or opting for opulence, this sixties resurgence covers all points on the sartorial spectrum. While a full look may be too reminiscent of Valley of the Dolls to be a jumping off point for this trend, sixties-inspired separates are undeniably wearable. An a-line skirt would be very au courant with a shearling-lined moto jacket, while a usually retro neck-tie blouse can look extremely Parisian with a fitted trouser and modest heel. Or channel your inner Edie Sedgwick with an unapologetically fierce (faux) fur jacket. But if you have a penchant for accessories, there are loads of retro shoes and purses to mesh into your 2014-approved wardrobe. While an up-to-there boot perfectly encapsulates mod squad style, a sleek Chelsea boot or ladylike stacked pump are equally appropriate (and chic) alternatives. And when it comes to bags, boxier is better. Compact, fuss-free and undeniably stylish, the boxy bag is the perfect way to infuse some swinging sixties into an otherwise current outfit. Will you be welcoming a sixties revival this fall? Sound off below.